An influenza victim, wrapped in a blanket, being escorted by a policeman, who wears a protective facemask of some sort, during the influenza epidemic in 1918. In the fall of 1918, Elizabeth Conway was 3 years old, but knew she had a big job to do. Her twin brothers, then 6, were so sick they couldn't get out of their beds in the family's home in the Olney section of Philadelphia. So were the children's Irish immigrant parents, Patrick and Margaret, who just months earlier lost a baby to stillbirth. Little Elizabeth tried so hard to help care for them, she was called "the little nurse." The family – my grandparents and their children – had all fallen to a worldwide flu pandemic that this year marks its 100th anniversary. The flu hit Philadelphia exceptionally hard. The city's Department of Health and Charities estimated that 150,000 people were sickened, though other estimates are much higher. Between Sept. 20 and Nov. 8, 1918, the city logged 12,687 deaths from influenza and related pneumonia. The illness started with terrible fatigue, fever, and headache, much like other kinds of flu. But many of the victims would start turning blue, coughing so violently that some tore their abdominal muscles. They bled from the mouth, nose, and some even from their ears. The disease, which came to be known as the Spanish flu, hit the young and healthy, with many victims dying within hours or a couple days after the symptoms began. Though her parents and brothers would survive, Elizabeth died on Oct. 16, 1918. This photo, taken in late 1923 or early 1924, shows the Conway boys, twins John and James, and younger brothers Eugene (writer Peg Quann’s father, front left) and Joseph. She was buried in a grave dug by her own father, who was still recovering from flu himself. This does not surprise Cait Kokolus, director of the Catholic Historical Research Center of the Archdiocese of Philadelphia, given the extraordinary death toll. In October 1918, there were 1,152 burials at Holy Sepulchre Cemetery in Cheltenham, where Elizabeth is buried. The previous October, there were just 114. 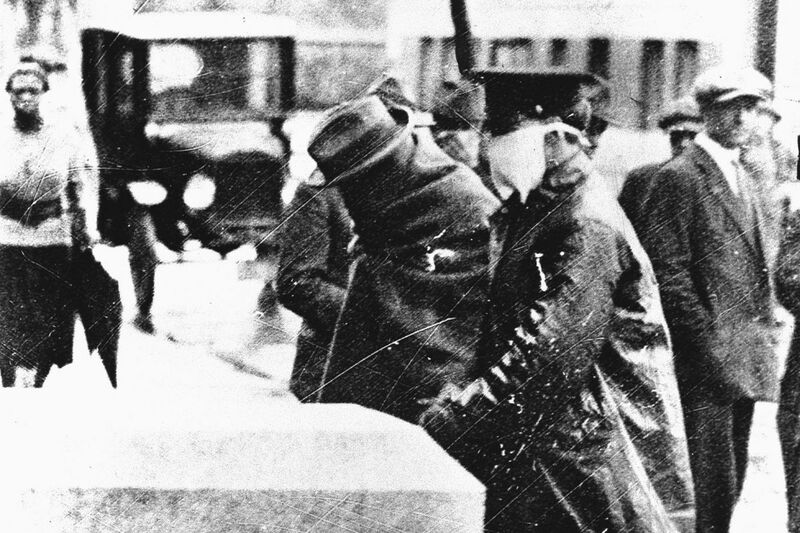 There was nothing uniquely Spanish about the 1918 worldwide flu pandemic, said James Armstrong, a retired flight nurse for Penn Medicine's PennSTAR helicopter service and a captain in the Navy Reserve who has studied the flu's history. Spain remained neutral during World War I. Nations at war were just as badly affected, but they didn't want to look weak, so they downplayed its impact, especially on their troops. Therefore, many people came to see Spain as the source of the flu epidemic. In fact, historians say Philadelphia's flu death toll was especially high because of another official effort to downplay the danger. On Sept. 7, 1918, a ship from Boston landed at the Philadelphia Navy Yard, and 300 sailors disembarked. Less than two weeks later, the Philadelphia Inquirer reported 600 sailors had been hospitalized with the flu, but none had died. Worried physicians urged a quarantine to stop the spread of the flu. But the nation was at war, and the city was planning a Liberty Loan parade for late September that, it was hoped, would help the city accelerate war-bond sales. Wilmer Krusen, director of the Department of Public Health and Charities, allowed the parade to go on as planned. Around 200,000 people lined the two-mile parade route on Sept. 28, enjoying the military bands and civilian displays of patriotism. Within three days, 117 civilians had died of flu. Aircraft hull in Liberty Loan parade in Philadelphia, Sept. 28, 1918. By early October, schools, churches, bars and restaurants were ordered closed. Usually, flu is most dangerous to frail people, such as babies and seniors. But adding to the terror, the 1918 flu seemed to target healthy teens and young adults. Children were orphaned, parents lost sons and daughters in days or even hours, newspapers kept by the Germantown Historical Society show. Emergency hospitals were set up in neighborhoods ravaged by the flu and the city recruited volunteer visiting nurses to help the homebound. Carts collecting bodies rolled down the deserted streets. The city's Auto Club assisted with ambulance duties while hundreds of nuns and seminarians of the Archdiocese of Philadelphia volunteered as caregivers and grave diggers. The city health department noted the heroic efforts of B'nai B'rith, while Mount Sinai Hospital in South Philadelphia wrote to Archbishop Dennis Dougherty, thanking him for sending nuns to serve in the Jewish institution. "So many of the medical staff and nurses had gone abroad to serve in World War I. Not only did we get this influenza but we were also short staffed," said Stacey Peeples, curator and lead archivist at Pennsylvania Hospital in Philadelphia. In Philadelphia, an estimated 150,000 people were sickened and more than 12,500 were killed during the 1918 flu pandemic. Nationally, more than 25 percent of the population was sickened and about 675,000 people died. One hundred years later, those who have studied the pandemic say that it is a public health event important both to our history and our future. For as much progress as medicine has made, the fact is that a flu virus could still wreak terrible havoc. "There's no way of predicting" when the next pandemic will occur, said Anthony Fauci, director of the National Institutes of Allergy and Infectious Diseases for the National Institutes of Health. But if a strain of flu pops up that is novel to the immune system of enough people, that's when a pandemic, with "abrupt and sudden" symptoms, can happen. Though 1918 is the deadliest flu recorded in modern times, pandemics have since occurred in 1957, 1968 and as recently as 2009. Seasonal flu can be severe but won't create pandemic conditions because many people have built up antibodies to the prevalent flu strain, explained David Morens, a captain in the U.S. Public Health Service. Flu vaccines must be developed every year because the dominant virus strains are always changing. That involves some educated guesswork, and so the vaccine is never 100 percent effective, but it's the best prevention available. Researchers are looking into ways to develop a universal vaccine that wouldn't require changes in the components each flu season, but that's still in the future. Armed with recent advances in genetic understanding, scientists are still trying to unravel what made the 1918 flu so deadly to healthy, younger people, Morens said. Researchers suspect that young adults, unlike their parents, at the time didn't have antibodies from exposure to earlier influenzas that appeared in the 19th century, he said. The flu of 1918 was known as an H1N1 flu, as was a 2009 flu that also sickened and killed many people around the world, including younger adults. But it was nowhere near as deadly as the earlier pandemic – and we can, at least in part, thank the 1918 flu for that fact. In 2009, most people born before 1957 had been exposed to earlier strains of H1N1 virus that descended from the 1918 flu, he explained. Also, antibiotics and antiviral drugs have helped flu and pneumonia patients survive symptoms that once were deadly. But public health experts still fear the potential impact of a deadly flu virus, and the 2009 flu shows why. The Centers for Disease Control and Prevention estimated that 59 million Americans contracted that H1N1 virus, 265,000 were hospitalized as a result, and 12,000 died. When the 1918 flu subsided, it was "quickly forgotten," Armstrong said, in part because World War I ended that November. A headline in the Dec. 8, 1918, Philadelphia Inquirer. "You had something you could celebrate or something not to celebrate – so they went with something to celebrate," he noted. In 2004, John Barry wrote The Great Influenza, considered a definitive history of the pandemic. As he wrote in the book and still says today, "there's no question that something like that could happen again." As important an event as it was, Barry says, he knows of no monument ever erected to honor the courage of those who put themselves in harm's way to care for the flu's victims or bury its dead. Armstrong found through his research that two nurses – Marie Louise Hidell and Edna Place — were among those awarded the Navy's highest honor, the Navy Cross, posthumously. They both died of flu after caring for sick sailors at the Philadelphia Naval Hospital. As quickly as the flu came to Philadelphia, it ebbed. By late October, churches, schools and social sites reopened. My grandparents moved to Germantown. In the next five years, they had two more sons, including my father, Eugene. No one talked much about the events of 1918 at home. We have no photograph of the little girl who would have grown up to become my Aunt Elizabeth. But my father's older cousin, Anna Burns, remembered playing with Elizabeth, who liked to hold tea parties for her dolls. She told me how my grandfather would go into the basement sometimes, and, sitting among those dolls and other toys he couldn't bear to give away, quietly mourn his daughter. Peg Quann is a Bucks County writer whose family has lived in the Philadelphia area since all four of her grandparents immigrated from Ireland around the turn of the 20th century, seeking prosperity for themselves and their families.